Article: Big Congratulations To Worldwide Phenomenon Dvicio On Their Nomination At The 2016 Latin Grammy’s! From bringing out musical masterpieces to all of their fans with their stupendous music and their “Justo Ahora y Siempre” album, to causing pandemonium in every country they go to, and even just recently being announced as performers at the 2016 Latin American Music Awards, every day equals a new success for worldwide phenomenon, Dvicio. The extraordinary band had another exciting accomplishment and milestone in their career today as it was just announced that Dvicio is nominated for their first time ever at the Latin Grammy’s! This is such an outstanding achievement for the band and they truly deserve it as they work endlessly to bring out the very best to all of their fans. Dvicio’s “Justo Ahora y Siempre” is nominated in the category “Mejor Video Musical Version Larga.” Dvicio shared their excitement over this phenomenal achievement as seen through the excellent Instagram video below! Here at Alexisjoyvipaccess.com, I’d like to send a big congratulations to Dvicio on their magnificent nomination at the 2016 Latin Grammy’s! So well-deserved! 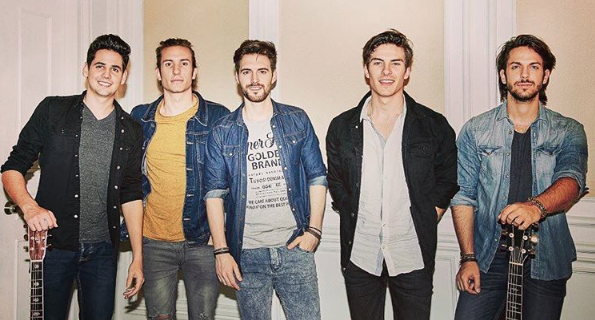 Follow @dvicioficial, @dvicio_andres, @dvicio_martin, @dvicio_missis, @dvicio_luis, and @dvicio_nacho on Twitter and check out our VIPAccessEXCLUSIVE interviews below! Next Article: Alessia Cara Kicks Off The Seventh Season Return Of TeenNick Top 10 As A Guest Host!